The Top of the West Horse Sale topped $120,400 on 30 horses April 11 at the Copper Springs Ranch in Bozeman, Montana, with a sale average of $4,010. Montana State University Equine Boosters treasurer Diana Bailey said 140 bidders were registered at the ninth annual event. The top selling horse – Weavers Doc O Gem – was donated by Stan and Nancy Weaver and brought $12,500. 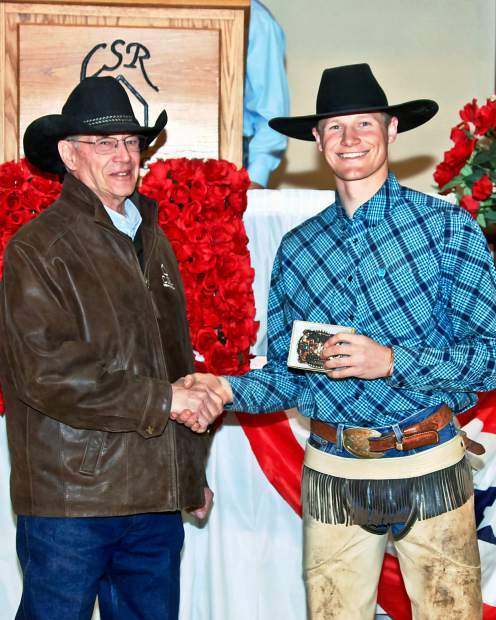 University of Montana Western's Sammy Bird trained the 2011 sorrel gelding. The horses and their riders also competed in the Colt Starting Competition April 10, where Montana State University Isaac Johnson earned the Top Hand Award, and the Western team took home the team trophy. Thanks to a solid livestock economy, generous donors and strong leadership in the classes, Brent Poppe, the MSU Equine Booster chair, noted gross sale revenues increased by $36,800 over last year and average per head sales were up by $1,130. "It was a tremendous sale this year," Poppe said. "I'd attribute that increase one, to general optimism and good financial times in the livestock sector. The other factor I'd attribute it to is just the quality of the colts being donated to both the Dillon program and the MSU program by our gracious donors." This year, 14 donors supplied the 30 colts in the sale. Proceeds from the 15 colts donated to and trained by the MSU program go to the Equine Boosters, a 501(c)3 not-for profit organization that works to support infrastructure and facility improvements for the college's equine science program. Similarly, proceeds from the 15 consigned by Western's students go back to the program through a foundation account and provides scholarships for students in the Sales Prep colt training class. "The quality of the horses was way up, the condition of the horses was way up, and the students keep getting better," Equine Boosters treasurer Diana Bailey said. "It's grown a lot as we've gotten higher quality horses into the program." Most donated horses are pedigreed or registered three- or four-year-old colts, and buyers are typically looking for solid ranch horses or performance and rodeo horses, Poppe said. Eric Hoffmann, the University of Montana Western's instructor and coach, said they work to prepare the colts for any situation, dedicating much of their training and riding time outside the arena throughout the year. "We get these horses out in the mountains a lot. Getting them up in the hills in the snow and the mud, that does a lot for these horses, and these kids. They learn a lot in a different environment than they are used to," Hoffmann said. "My biggest joy out of the whole deal is watch those kids take these colts up in the mountain for the first time and then see everything go smooth for them." Western took six of the top ten spots in the competition, with their Jessica Thompson earning second place behind MSU's Johnson. MSU's Carly Strutz earned third place in the Colt Starting Competition. Miles City Community College has also participated in the competition and sale in the past, although it did not have students participate this year, and this was Western's fifth year at the sale. "Competition breeds improvement in these programs, so to offer those schools the opportunity to consign their colts for sale, and enjoy some of the benefits of the project, helps them all," Poppe said. As the competition and sale have grown, so has the buyer depth and the event itself. 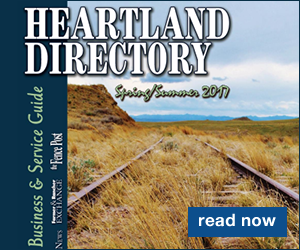 What used to be a buyer pool of about a 100-mile radius around Bozeman has now expanded to not only states bordering Montana, but Colorado, California and Indiana, as well, Poppe said. "One of the best things that's happened is the Copper Springs Ranch coming on board," Bailey said. "They let us use their beautiful venue, do the ground work, use their staff, set up panels… that's a big, big boost to the program." Headwaters Livestock ran the sale with Garth Isbell of Isbell Auction calling. "The quality of the training and instruction that these students receive and put into their respective programs really shows in how gentle these colts are and how well broke they are," Poppe said. Reata Branneman came on as the MSU class instructor and coach in 2013. "It's been an incredible asset to have Reata teaching that program, too," Bailey said. 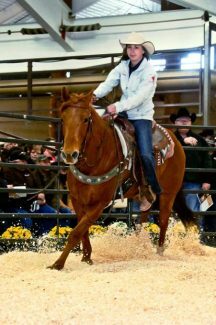 Branneman also has MSU students post videos and photos to update progress on their colts on their MSU Colt Training Class Facebook page, and she's created a marketing segment class to prepare the annual sale catalog. Hoffmann has been with the Western class since 2008. This year, 11 students were chosen for the colt training class from around 80 students enrolled in Western's Natural Horsemanship program, Hoffmann said. They work with their colts five days a week for three hours a day, plus weekend chores. Similarly, Bailey added, the MSU students spend around 14 hours each week horseback to prepare colts for the competition and sale. But even more important than the trophies and sale tallies is the educational process and lessons learned along the way, they all agreed. "It's a really large commitment," Hoffmann said. "Kids are here over spring break, Christmas break, days off school. People can trust those kids, when they say they're going to do something, they do it." In Bozeman, the students also take on the jobs of planning, preparing for and marketing the sale. 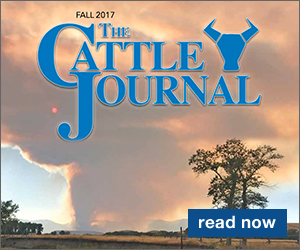 "They do a tremendous amount of the marketing work, a tremendous amount of the logistic work for the sale, a tremendous amount of the legwork and reaching out to our very gracious sponsors," Poppe said. "The real value in that type of participation is that it's hands on, life experience in managing an event or project that's related to the equine industry." While the students watch their colts transform and grow in the training program, Hoffmann said he most enjoys watching the students grow in responsibility and maturity as individuals and grow together as a team. "The team thing is the best part to me," he said. "We've been very successful with the horse part, and I think it's because of that more than anything else."